Many children are enamored with horses and long for riding lessons. Horseback riding can be a great pleasure providing terrific exercise for young riders (as well as the horses!). 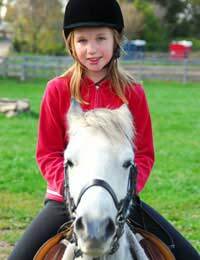 Often, children who learn to ride continue horseback riding into adulthood, helping to keep them fit and healthy. While parents who are experienced equestrians are capable of teaching their children safe riding practices, most parents would be wiser to hire a professional instructor, at least for the basics. Individual instruction is recommended in the very beginning, with children moving into group lessons as their skills improve, but sometimes the cost of one-on-one instruction is prohibitive. As long as the ratio of children to instructor allows each student to get the attention that they need, group horse riding lessons will work for most children. Parents should interview prospective instructors as well as touring the stables and grounds to be sure that the environment seems safe and well tended. Asking for and checking references is highly recommended since personality and the ability to relate well to children is vital. While experts will stress that a child's size, strength, ability to focus and take direction, and desire to learn horseback riding are the best indicators that they are ready to begin formal lessons, the typical age range for beginners is between 5-7 years old. Parents should make sure that their child wears proper attire, including long pants, sturdy shoes or boots, and most importantly, a well fitted safety helmet. Some stables may have helmets for students to borrow or rent, with a purchase recommended if the child decides to continue lessons. Children must be advised as to the importance of following all of the rules and asking questions if they have concerns or do not understand what is expected of them. Horse riding instructors who work with children are typically very patient and understanding, hoping to give children positive experiences in hopes that they will develop a lifelong appreciation of the sport. Once kids have basic horseback riding skills, they are likely to want to expand their riding experience by looking for opportunities to utilise and expand their existing skills. Horseback riding camps offer kids of assorted ages and abilities the chance to spend a solid block of time focusing on their chosen sport. Camps range in price and quality, so parents need to scout out well-run specialty camps before enrolling their children in a session. Many stables that offer lessons hold occasional competitions, open to all riders, even beginners. Riders are normally categorised by age and ability, with inexperienced riders participating in walks and trots. More advanced riders may be offered the opportunity to showcase their skills in jumping and putting their horse through specified paces. If children choose to compete, parents and instructors should be sure that the emphasis remains on fun and sportsmanship, rather than only winning. Everyone likes to win, but kids should understand that the benefits of horseback riding go far beyond accumulating an assortment of ribbons and trophies. Horseback riding is great exercise, offers opportunities for fresh air fun, teaches responsibility and caring toward animals, and is enjoyed by people of all ages, making it an ideal family activity.